In this WAHOO KICKR Review we consider whether the 2017 iteration is WAHOO’s best yet. Maybe it is? espeically when combined with WAHOO’s recent announcements to support: structured/scheduled workouts; the new Bolt; and the new KICKR-CLIMB. The KICKR smart trainer makes a compelling case for anyone considering upgrading their indoor bike training experience or embarking on ‘smart’ training for the first time. It must even be a contender for the accolade of best bike smart trainer. The cassette is not shiny as I actually use it. WAHOO’s KICKR ticked all of my boxes, and more besides, to deliver a quality ‘road-feel’ and miles of immersive, uber-connected tech awesomeness making me look forward to winter with a heightened sense of pain cave anticipation . Either way, the KICKR17 is similar to the KICKR16 (and the KICKR 18 !). And this release also coincides with the release of an upgraded KICKR SNAP17, mid-range trainer and the KICKR CLIMB gradient simulator which is not compatible with KICKR2016, V2. KICKR17 has introduced some minor physical changes for mechanical compatibility – notably with their new KICKR-CLIMB unit; disc brake clearance and with thru axle compatibility (12×142, 12×148). For those of you new to the KICKR you will find a product that is targeting the high-end of the market. The KICKR claims accuracy BUT ALSO how that accuracy is delivered with a ‘true-responsive‘ ride feel. The KICKR keeps the same level of ‘professional-grade durability’ as before, also giving you 2000w of resistance. It also keeps the additions of last year’s accuracy improvements, noise reduction, LED status lights and carry handle. The KICKR is compatible with pretty much all leading apps and head units. I can’t think of one it’s not compatible with. Rides a structured workout/also ERG mode – you can download an electronic plan, or your coach can send you one, where all the instructions and controls needed to execute the plan are contained within it. ANT+ FE-C defines the smart controlling mechanism used in a workout. WAHOO do not (yet) do the latter two, which I would argue are of peripheral use. If you can afford it; or if you consider yourself to be at least a vaguely serious cyclist, then WAHOO’s KICKR could be for you. It’s a great choice for ZWIFT, it’s a great choice to complement other WAHOO products or high-end Garmin products like some Edge models. If you want compatibility with TrainingPeaks workouts or Golden Cheetah interactivity or Today’s Plan workouts or apps like Velo Trainer or Peri Pedal … then you’re good to reach for the Visa card. If you have a bike with a thru axle and a disc brake then there may well be very limited alternatives. For a lower price I’d look at the WAHOO KICKR SNAP or TACX FLUX or TACX VORTEX SMART. For a super low price I’d get just about any £100/$100 ‘dumb’ trainer and use whatever power meter you might use for normal road use. SNAP vs KICKR – In a real-world comparison, the SNAP: uses your bike’s wheel; has a lighter flywheel; is a fraction less accurate; and, most likely, noisier. That’s it really. Whilst we will soon see that the KICKR is not so big in itself it does come in a rather large box. You get the KICKR itself and all these bits. You’ll know what most of them are but of note we see: the black bit to protect disc brake pads; a spacer to enable your 10 speed cassette to fit; 3 adapters for KICKR CLIMB compatability – I’m using the one for a standard skewer. Before we have a look at the setup, just briefly look at the KICKR when fully assembled and ready to take a bike. The things to note are: 3 supporting feet; a carry handle; a fly-wheel/resistance mechanism driven by whatever is fastened to the cassette ie your bike. I didn’t need to follow any instructions to set it up. It seemed fairly obvious to me. It’s not that hard. By moving the blue slider up and down the central foot, the height of the KICKR is adjusted to make it level for the kind of bike you have. You can see from the label that sizes are covered from 24″ road and MTB wheels through to 29″ MTB wheels. Most of us will be using the 700C road bike setting. It’s fairly stiff to move the blue slider and it is a little bit fiddly to get the threaded pin through and threaded in place. There might be a danger of cross-threading and/or damaging the threads so make sure it’s all lined up before tightening. If you have an 11-speed cassette you’ve done all the hard work. Apparently lots of you have those. I haven’t. That’s fine though. No doubt most of you will have a spare cassette, like me. You might also have a spare riser. But you won’t need the riser! cool. Because there is no rear wheel with the KICKR then it rests at the right height for your normal front wheel. But getting the cassette on needs more than just the cassette. First up make sure you have your existing innermost spacer – the one on the right in the picture below – you will need that AND THE ONE PROVIDED. Yep. You might also need: a chain grip; a bike computing device of some sorts; and a cassette lock ring remover. Although you will NOT need a wheel block/riser for your front wheel, I’d still use one to catch some sweat and keep the wheel straight. Also, bike hack, you might find a few bits of garden wire handy to keep the cassette cogs and spacers in the right order. As long as they are in the right order you will be fine, it is only possible to put each cog on the cassette in one precise orientation – but there are mathematically hundreds of possible wrong combinations of relative positions for cogs and spacers. Go and get your bike. Take off the rear wheel and you are good to attach it to the KICKR. It will look something like this and I shouldn’t have to tell you about how to tighten up the skewer. Before trying to put your bike on ensure that the rear mechanism has either the chain engaged in the smallest or second smallest cog (NOT as shown in the image above). Take considerable care to ensure that you have properly engaged the skewer and frame and then properly tightened the skewer. It is VERY EASY to do this wrong. You will then find your bike is tilted but you will probably only end up damaging the skewer in reality. To really and properly bed the bike onto the skewer I found it helped to lift up the front wheel and wiggle the bike a bit, just to make sure it is all seated properly. And yes I have changed a bike wheel a million times…just saying’. It’s NOT that simple. My TT bike has a rear-entry/rear drop-out wheel rather than a normal road bike where you would push the frame down onto the wheel. For the TT bike it’s easiest to entirely remove the skewer until the frame is in place. In this scenario it takes a good minute or two to attach your TT bike. Almost there! Under each foot there are adjustable, locakable circular pads which you adjust to make the bike level. As shown…that will do nicely, although it will not have to be perfectly level. If you find you are making excessive adjustments to the legs then it is highly likely that you need to return to the previous step and make sure that the bike frame is properly engaged. The WAHOO KICKR takes up a little less space than my previous, basic, ‘dumb’-trainer that just applied resistance to my existing rear-wheel in some way. It probably looks nicer too. If you are upgrading from a dumb trainer to this smart trainer than the KICKR will be MUCH heavier. If, like me, you had a habit of dragging the bike+trainer around your pain cave then be very mindful that the bike REALLY needs to be properly attached to the KICKR and the skewer properly tightened. Indeed I would be careful dragging the KICKR and your bike around fastened together. Indeed…don’t do that. It is easier to put the legs IN to carry the KICKR around but I can just about manage a one wheel bike under one arm and the KICKR in the other dragging the power cable along the ground. The point of that is not to tell you how strong I am but rather to say that it IS a bit of a faff to move it every day from a storage place to your training space. But it can be relatively easily done. The handle is pretty handy. Thought you’d like to know that. It’s a typical handle thing. Pairing is straightforward.in either BLE or ANT+. You know what to do…in case you don’t then you’d typically pair it as a FE-C trainer (or similar) rather than a power meter. Providing you’ve plugged in the power, if you start pedalling then it starts transmitting. You get a total power figure in the sense of right+left power combined, a speed/distance estimate* but no cadence. Note that the power might well differ from a secondary power reading from a crank- or pedal-based power meter due to drive train losses. Surprisingly this is likely to be 2-3% in the 200-300w range (Source: Cycling Power Lab) as an aside there are several things you can do to lessen this loss from: expensive ceramic bearings; to correct lubrication; to using an 11-speed chain – even on a 10-speed cassette. I’ll say it again: no cadence! Use the included WAHOO cadence sensor if you want to (works for ANT+ and BLE). WAHOO’s proprietary ‘SMART TRAINER CONTROL’ method over Bluetooth Smart. Although that is proprietary it is used widely. There are probably subtle differences over each but I don’t think that matters to most of us. Finally just double-check the default settings are what you want the KICKR to do – you can turn on speed and make it display actual wattage rather than target wattage in a workout. * speed shows in WAHOO’s app and on the ELEMNT/BOLT but does not appear to be saved by the ELEMNT into the FIT file when read by some applications…I’ll have to get to the bottom of this. Bi-weekly calibration is required and is called SPINDOWN as you speed up to 38kmh and then freewheel down as the KICKR tests the brake. It’s quick to perform and there’s no harm in doing it before every ride. Mode 3: Erg – Workout towards a set target. As cadence drops so resistance increases to compensate. 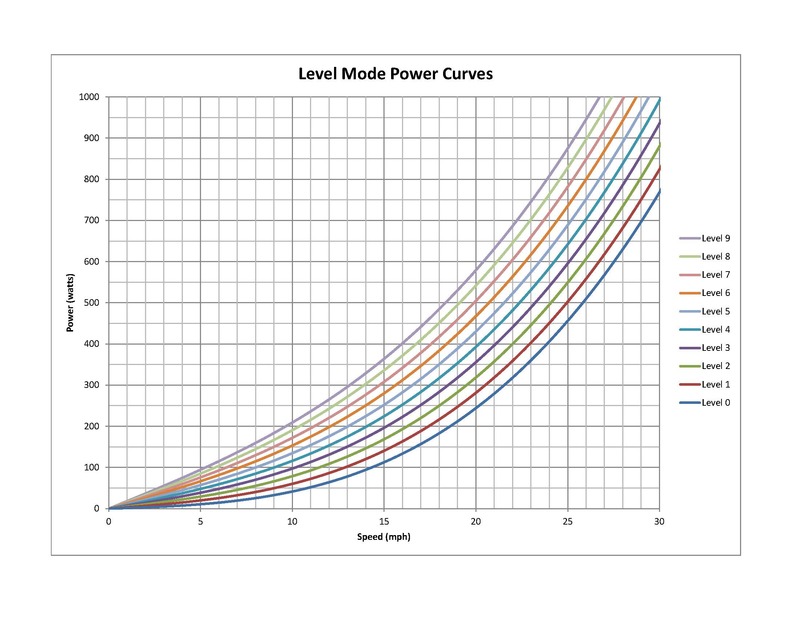 Mode 4: Sim – You specify weight, bike type, riding position, headwind, tyre size and grade then the KICKR models the power/speed curve to simulate YOUR outdoor riding experience. The blue light indicates a BLE connection. The light’s are handy as it is immediately obvious when you have failed to turn on the mains power. As we’ve already said the KICKR transmits power (+ usually also estimated speed/distance) and accepts resistance control from 3rd party units. Heart rate monitors, muscle oxygen sensors, temperature sensors, speed sensors (not relevant as you have no wheel) and cadence sensors all will connect to your 3rd party unit – be that a cycling computer or app. Also worth mentioning here is the KICKR CLIMB which partners with either the KICKR18 or KICKR SNAP17 to raise the front wheel to simulate a gradient. That’s another sensor – albeit one that’s controlled from your head unit. Use ‘Erg’ mode with fixed gear, fixed cadence and fixed wattage. You vary cadence, it varies resistance to match wattage. The workout can come from an online plan or from your coach. Game mode. Just doing what you would do normally outside…but inside…against electronic people on a far away island that doesn’t exist. Of course this is just as good as training outside in terms of the physiological benefits. And you don’t get wet when it rains…or crash. Most of the nuances you experience will come down to the method of external resistance control you are using. HOWEVER the one specific area of interest is how the KICKR 17 responds to changes in power. Many years ago I got fed up with using ways to automatically change my trainer’s resistance. Maybe I had the wrong trainer models but suddenly jumping from 150w to 350w resulted in what seemed like an out-of-this-world increase in resistance as my legs ground to a near halt. Absolutely nothing like real-world cycling, in my experience. Even Wattbikes are guilty of this in my local gym, albeit to a lesser degree. I would say that how the KICKR 17 responds to changes in power is pretty awesome – in my opinion. Let’s say you are going from that 150w to 350w jump I mentioned earlier; I estimate that the KICKR 17 takes about 3 seconds to incrementally make the adjustment in resistance…5 pedal revolutions. Feels ‘perfect’ to me. If you are more/less powerful/heavy than me then I don’t know if it’s the same 3 seconds, maybe it adjusts proportionately. In the next few sections I will look at some free ways to use methods to control the KICKR as well as some popular subscriptions services. I’ll briefly look at how well your Garmin or WAHOO cycling computer might work with the KICKR. But there’s a whole big world of 3rd party software and apps to consider too. WAHOO’s training app is good. Over the years I have found it more reliable than most and it seems to pair WITH a wide range of sensors to a MUCH better degree than other apps. So if you want a free APP to simply control your trainer from a phone/tablet then the WAHOO app is an obvious Choice. Here is a slideshow to give you a flavour of the simplicity of pairing as well as some of the screens you see when training with KICKR. Before covering WAHOO’s ELEMNTs I will look at the higher-end Garmin Edges. At the time of writing Garmin are updating how workouts are created in their Garmin Connect (mobile) environment. Creating a workout online is a little fiddly but generally Garmin’s offering here is good and fairly comprehensive workouts can be built. Have a look at the slideshow that follows for a flavour. Workouts are nicely sync’d through Garmin Express but then you might get the problems. In my experience the Edge 820 has touchscreen problems so sweat may change the screen and your finger swipes may not. In addition to the physical control of the device there is also a usability issue where it is unwieldly to get to various trainer control options mid-ride and that is further compounded by the touchscreen. For occasional workouts the Edge will be fine. But for a 5 hour a week, 3month winter pain friend I think you would soon make an enemy. You can use the WAHOO ELEMNT/BOLT to control the KICKR just as you can with an app or Garmin. The screen flow is fractionally confusing when you first use it with your Garmin ‘hat’ on. Get past than and it’s pretty good with both the physical control from the buttons and from the data that is displayed. If you want to follow a plan or structured workout then WAHOO do NOT provide that facility. Instead you could use the free/basic version of TrainingPeaks or subscribe to Today’s Plan. I’ve shown some screenshots of the workout builder from TrainingPeaks, below. The workout builder IS a little confusing at first but there are usually several ways to end up with the result you want. The great thing then is that your workout just finds its way to your WAHOO ELEMNT/BOLT. The whole process is well-integrated and I would certainly use it if I needed to. I would even ALMOST go as far as recommending TrainingPeaks BASIC for this purpose except you can’t schedule future workouts without upgrading. Golden Cheetah is pretty awesome, FREE, and is an advanced cycling analysis software package. It also has a workout recording and monitoring function as well as the ability to run a pre-built structured workouts from numerous sources. Here’s another slideshow to show you how a workout, created for free in the Basic Edition of TrainingPeaks, can be exported to your computer and then executed by Golden Cheetah to control the KICKR. Golden Cheetah also supports several unusual features such as: MOXY support and the ability to see W’ as you perform the workout. I seem to have a few problems from time-to-time opening workout files with Golden Cheetah and the interface is not always intuitive. That’s the occasional price of awesomeness, unfortunately. Set in the fictional virtual realm of Sufferlandia, Sufferfest is a structured training program augmented by the use of video footage from ‘proper’ races eg TdF. You might get a “60-days free” offer when you register your KICKR but beware that this is a little disingenuous as you actually get a week free trial period and then a credit for the rest of the 60 days spread over a couple of months. Sufferfest is loved by many and certainly has its place in training. It’s not quite my thing, but maybe I’m a bit of a wimp? ;-)The SUFFERFEST app/software supports older computer hardware than ZWIFT. Here are some indications of how to link the KICKR. And on the feel of the app & its structured workouts. It works well and flows well. ZWIFT is set on the imaginary Pacific Island of Watopia and also in a virtual London-Surrey hybrid. You can race against yourself or other people on these courses for PBs or pleasure. That’s great in itself but the winner for many people is that Watopia also exists on STRAVA with all the segments you’d expect. Other great features include structured workouts, challenges and riding with friends. Even the cynic in me says, “It’s pretty cool“. Currently you can try ZWIFT free for 7 days but the lack of ‘offers’ suggests it is doing well. The downside I found is that older spec computers are not supported eg 32 bit Windows. That aside it is packed full of really great stuff only a fraction of which I have shown here in yet another slideshow…. There are plenty of other apps to choose from too. WAHOO’s KICKR is most likely to be supported by most apps because of its track record of openness and the initial work around the Bluetooth trainer control ‘standard’. Here are the officially supported ones and if you click through to WAHOO they should keep the full list updated as time passes. This chart is as good as any…it looks accurate to me following a structured workout and comparing to Favero ASSIOMA and Watteam Powerbeat – both dual-sided and both brand new. The latter was factory calibrated and factory-installed before I received it. Here are the same devices at slightly higher power levels. Nothing of any note apart from the one WatTeam dropout over the 30 minutes. Here I turned off much of the smartness and instead did it ‘old style’ with me changing the resistance from time to time. It’s fractionally more awkward having to manually press a button than follow a workout but I have many button-pressing skills, so all was good. Two things of note here is firstly that the Watteam struggled a bit at the slightly higher power levels and/or relatively rapid changes in power. Also that the WAHOO BOLT (+KICKR) seemed to be showing some discrepancies on the screen. But as you can see, the data that was stored was all good, consistent and not of note. I’m going to add some more charts in here: covering Favero bePRO and Garmin VECTOR. Although it seems that I may be really using the bePRO session to calibrate the bePRO using the KICKR !! The only issue I experienced was around ensuring that the bike was correctly attached to the KICKR 17. You are using a 10 speed cassette without the spacers. You just crank out way too much power and, in fact, the whole house is rocking. The KICKR18 model (2018 model only) found manufacturing issues linked to excessive noise creation and short-circuiting in certain (static) environments. These issues have been addressed in any retail unit you will buy now. Some people will want a silent and EVEN MORE accurate trainer. It’s more than fine for me and WAY better than previous trainers I’ve used. You can pay for more acuracy and you can pay for even greater quietude. I was mightily impressed. The structured workout integration was as good as I expected and I was converted to the immersive training experience provided by the KICKR 17 and ZWIFT, having previously been sceptical of the latter. It’s a quality piece of kit and it seems to me to perform to a high standard in all respects. It’s more than quiet enough for me but it does make some limited amounts of noise. It’s fairly heavy but that is integral to the design. I rarely make a recommendation as we all have different needs from our sports technology. However the openness of the WAHOO platform gives me the confidence to recommend the KICKR 17 knowing there will be an app somewhere to almost certainly meet your needs providing you have the right axle and cassette compatibility. If you like to support this blog and would like the confidence of buying a high value item directly from the manufacturer at the same price as other shops then please use the image link below to WAHOO. It should click through to your local, online WAHOO Fitness store. From time-to-time WAHOO run price promotions and offer discounts on the page linked to below. Maybe this is a regional thing, but in Germany/Switzerland the difference between both is negligible low… You’ll find the NEO regularly for 1000-1100 € – depends on shop and season. no it’s not regional. I just didn’t check widely enough. uk prices vary from £1250 to about £960. so you are right.